Taraxacum kok-saghyz, often abbreviated as TKS and commonly referred to as the Kazakh dandelion, rubber root, or Russian dandelion, is a species of dandelion native to Kazakhstan, Kirghizia and Uzbekistan, that is notable for its production of high quality rubber. T. kok-saghyz was discovered in Kazakhstan in 1932 by the Soviet Union in an effort to find a domestic source of rubber. Kok-saghyz is derived from the Kazakh kök-sağız (көк-сағыз), with kök meaning root or tuber and saghyz meaning rubber or gum. Its latex was traditionally used as a kind of chewing gum. Taraxacum kok-saghyz is a perennial plant with a yellow composite flower characteristic of the genus Taraxacum. Each flower head may be approximately one inch in diameter and be made up for 50 to 90 florets. Plants may contain 25 to 50 leaves arranged in one or more rosettes at the upper end of the root. Taraxacum kok-saghyz can be differentiated from the common dandelion (Taraxacum officinale) by its generally smaller, grayish green leaves and hornlike structures on the bracts surrounding the bud. Flowers are hermaphrodite, insect-pollinated (entomophilous) and are on stalks that reach about a foot in height. Taraxacum kok-saghyz is usually in flower from May through June, with seeds ripening from June through July. It is a diploid species that reproduces sexually, and produces good pollen. Another species, a triploid apomict that also has horned bracts and produces rubber, T. brevicorniculatum Korol. has frequently been misidentified as T. kok-saghyz. 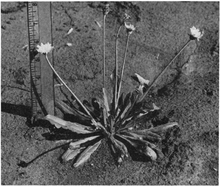 Taraxacum kok-saghyz does best in loose, well-drained soils with high moisture retention and a pH between 5.5 and 8.5, in full or nearly-full sun. Taraxacum kok-saghyz, together with Taraxacum hybernum [ru] and Scorzonera tau-saghyz, was cultivated on a large scale in the Soviet Union between 1931 and 1950 during World War II as an emergency source of rubber when supplies of rubber from Hevea brasiliensis in Southeast Asia were threatened. It was also cultivated in the United States, the UK, Germany, Sweden and Spain for the same reason. During this time period, the highest yields achieved by the U.S. were 110 kg of rubber per hectare, while the USSR achieved yields of 200 kg of rubber per hectare. With the conclusion of World War II and the return of affordable Hevea brasiliensis rubber (which has 8-10 times the yield), the majority of T. kok-saghyz programs were discontinued. There has been a resurgence of attention on T. kok-saghyz due to allergic reactions to Hevea rubber used in medical devices, and to shortcomings of the Hevea brasiliensis rubber supply. One threat to Hevea brasiliensis rubber production is the South American Leaf Blight (SALB), which has afflicted conventional rubber production in South America since 1934. This blight may spread to the Hevea brasiliensis trees in Southeast Asia, which are genetically very similar to each other and those of South America. Furthermore, land used for rubber production is being converted to palm oil plantations in order to produce biofuel, and labor costs reduce the profitability of Hevea brasiliensis plantations, as each tree must be manually tapped in order to harvest its latex. Rising oil prices limit the economic viability of synthetic rubbers, and natural rubber often cannot be pragmatically replaced by a synthetic equivalent. Taraxacum kok-saghyz cultivars that are easier to cultivate and produce more and better rubber are being developed as part of a large research project at many institutions. Inulin produced by T. kok-saghyz is a sugar that could be used in non-food applications or be turned into bioethanol through fermentation. The remaining plant biomass could be used to produce biogas. ^ a b c d Kirschner, J.; Štěpánek, J.; Černý, T.; Heer, P.; Dijk, P. (2013). "Available ex situ germplasm of the potential rubber crop Taraxacum koksaghyz belongs to a poor rubber producer, T. brevicorniculatum (Compositae–Crepidinae)". Genetic Resources and Crop Evolution. 60 (2): 455–471. doi:10.1007/s10722-012-9848-0. ^ a b c d e f Nowicki, Marcin; Zhao, Yichen; Boggess, Sarah L.; Fluess, Helge; Payá-Milans, Miriam; Staton, Margaret E.; Houston, Logan C.; Hadziabdic, Denita; Trigiano, Robert N. (December 2019). "Taraxacum kok-saghyz (rubber dandelion) genomic microsatellite loci reveal modest genetic diversity and cross-amplify broadly to related species". Scientific Reports. 9 (1). doi:10.1038/s41598-019-38532-8. ISSN 2045-2322. PMC 6374447. PMID 30760810. ^ Mayhood, Kevin (July 1, 2008). "Roots to Rubber". The Columbus Dispatch. Retrieved May 1, 2011. ^ a b c Van Beilen, Jan B.; Poirier, Yves (2007). "Guayule and Russian Dandelion as Alternative Sources of Natural Rubber". Critical Reviews in Biotechnology. 27 (4): 217–31. doi:10.1080/07388550701775927. PMID 18085463. ^ Craymer, Lucy (October 2, 2018). "Dandelions Ruin Your Front Yard but Could Be the Future of the Rubber Industry". Wall Street Journal. ^ a b Whaley, William Gordon; Bowen, John Stevenson (1947). Russian Dandelion (kok-saghyz) An Emergency Source of Natural Rubber. United States Department of Agriculture. p. 12. OCLC 12131809. ^ a b Rodin, L. E. "Taraxacum kok-saghyz". Plants for a Future. Retrieved May 1, 2011. ^ a b "Blow Out: The Tyres of the Future May be Made from Dandelions". The Economist. December 30, 2009. Retrieved May 1, 2011. Wahler, Daniela; Gronover, Christian Schulze; Richter, Carolin; Foucu, Florence; Twyman, Richard M.; Moerschbacher, Bruno M.; Fischer, Rainer; Muth, Jost; Prufer, Dirk (2009). "Polyphenoloxidase Silencing Affects Latex Coagulation in Taraxacum Species". Plant Physiology. 151 (1): 334–46. doi:10.1104/pp.109.138743. PMC 2736003. PMID 19605551. Krotkov, G. (1950). "CHANGES IN THE CARBOHYDRATE METABOLISM OF TARAXACUM KOK-SAGHYZ ROD DURING THE FIRST AND SECOND YEARS OF GROWTH". Plant Physiology. 25 (1): 169–80. doi:10.1104/pp.25.1.169. PMC 438030. PMID 16654275. This page was last edited on 8 March 2019, at 12:13 (UTC).